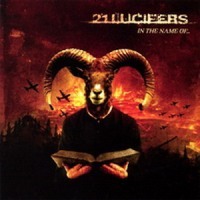 21 LUCIFERS was formed in 2002 under the name GRIDLOCK and after a few line-up changes they decided to change their name to 21 LUCIFERS. What we have here on their debut album entitled “In the name of...” is a straightforward fast and furious piece of Death/Thrash/Grindcore Metal. People who prefer their music melodic and poppy should steer clear of this album. But<?xml:namespace prefix = o ns = "urn:schemas-microsoft-com:office:office" /> on the other hand... if you’re looking for tons of aggressive and faster than the speed of light guitar runs then this album is just right for you. 21 LUCIFERS take no prisoners; to put it simple... they destroy every thing in sight with every single track... 18 of them. (21 according to my CD-player.) 33 minutes and 37 seconds of pure mayhem, boys and girls. There is simply no way for me not to smile from ear to ear when listening to this piece of Metal. Because... even if their music is fast and aggressive as hell, “In the name of...” is packed with catchy guitar runs. (If you can use the word “catchy” in this kind of music?). Every time the CD is done I press play again because every single track stand out of its own, but then again... I have found a few personal favourites: “Greed Spreader”, “Hate Will Prevail” and “Surprise You’re Dead” just to name a few. I know that there are millions of Death/Thrash/Grindcore Metal bands out there to compete with, but I’m sure that 21 LUCIFERS can make it. So if you have decided to buy only one extreme metal release this month... make sure that 21 LUCIFERS: “In the name of...” is the one.